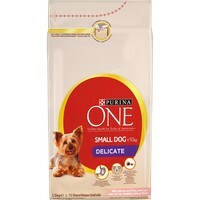 Purina One Delicate Small Dog Food 1.5kg (Salmon & Rice) provides targeted, advanced nutrition in a delicious meal with small crunchy nuggets and softer kibbles, specially designed for a smaller mouth. A great tasting recipe with Salmon, the food contains high levels of Omega-3 fatty acids to help manage sensitive skin, natural prebiotics to help manage delicate stomachs and a specific combination of antioxidants and high quality protein to help support a healthy immune system. Suitable for dogs with a delicate digestion over 1 year of age and weighing 1-10kg.